Over the past couple of weeks, I’ve shared a 3-part series about the reasons why moms hide their tears in the shower. If you’ve missed the previous posts, you can read Part I here and Part II here. This is the final post of this series. I think this is the quote that best sums up the number one reason moms cry in the shower. It’s the absence of connection with ourselves. Somewhere along the road, we forget who we are. We embark on building the life we’re “supposed” to and slowly abandon the pursuit of the life we long for. We fill our lives with responsibilities and commitments. We juggle the expectations of our roles. Making time for ourselves is no longer a priority. We stop dreaming nevermind chasing those dreams. Hobbies fall by the wayside and passion is forgotten. It’s no wonder so many feel overwhelmed, lost, and purposeless. We have to learn how to reconnect with our sense of self. Remember that aside from all of the roles and responsibilities, we are also individuals. Individuals with a soul, ambition, and purpose in life. We have to learn how to revive our dreams, passions, and hobbies. Learn how to tap into the core of our essence. That inner part of us that yearns to live a more fulfilling life. If you don’t know what that looks like, you need to make the time to be still, be silent, and allow things to come to the surface. Recall memories of things you enjoyed, places you liked working and volunteering in the past, hobbies that made you lose track of time, ambitions you once had. You might find that somethings no longer fit in with the person you are today and others might surprise you because you still long to pursue them although you haven’t thought of them in a while. We get so caught up in chasing the life we think we should be pursuing that we let go of the life we long to pursue. If this resonates with you, it might be time to evaluate the life you’re building and see how you can bring a deeper sense of meaning to your life. To all of the moms who cry in the shower because they feel overwhelmed, lost, or yearn for a sense of fulfillment in their lives, you aren’t alone. There are more women who feel this way than you might realize. I was once that mom as well. It was a heartbreaking, guilt-ridden, empty place to be. Today I want to encourage you to rewrite your story about your sense of self. Rewrite the story of who you are. I encourage you to rewrite the story of who you are using a stream of consciousness. This means that you write your thoughts and feelings as they arise. Don’t edit, erase, delete, or censor. Just allow yourself to document what comes up for you. What did you dream of doing when you were a child? What about as you neared adulthood? What was your passion as a child? Who do you think you should be? Who do others think you should be? Without using roles, responsibilities, or labels, who are you at your core? Are you building a life based on who you are at your core or who you/others think you should be? What do you believe your purpose in life is? At what point do you think you began to disconnect from who you are and what you wanted, and who you’re meant to be in life? What can you do now to bring a deeper sense of meaning and fulfillment to your life? I pose these questions to help you to embark or continue on your journey of self-discovery. To support you in your desire to build a fulfilling life and help you find your way. It’s by making time to sit and ponder questions like these and allow the answers to present themselves when you least expect it that you’re able to cultivate the deeper sense of meaning in your life. This isn’t to say that you aren’t grateful for the life you have or the people in it. It just means that you want to be more intentional in building the fulfilling life you’re worthy of. The journey of self-discovery can be scary and uncertain but it can also be exciting and enlightening. So many answers and solutions lie within, we just have to learn how to connect with ourselves to get them. If you struggled to answer these questions or found that you really want to dive into this journey of self-discovery, you might find this 30-day practice useful. Each day has a prompt to encourage you to discover something about yourself. The prompts support the physical, mental, emotional, and spiritual aspects of your journey. It’s up to you how much time you spend each day, whether it’s 5 minutes or 50. The important thing is that you do it consistently. It’s valued at $59 but I’m extending it to you at no charge because I know what it’s like to be that mom who longs for a clear sense of self and deep meaning in life. I’m so grateful to have found my purpose and want to support others in doing the same. I know that those who are meant to put this into practice will find it in perfect timing and I’m honored to extend this to you. Enter your details to start your practice. May it support you in your journey of self-discovery just as it has supported the dozens of women who have implemented it already. Of the three reasons, which one resonated with you the most (too strong for too long, neglect your needs, lost your sense of self)? Did you find relief knowing you aren’t the only one who deals with this? Are you interested in the journey of self-discovery and growth? I’d love to hear your thoughts on this series. If there’s a reason you’d add as a fourth, share it in the comments! You’re always welcome to join the sisterhood, a safe space created to support you. PS- remember that my inbox is always open. 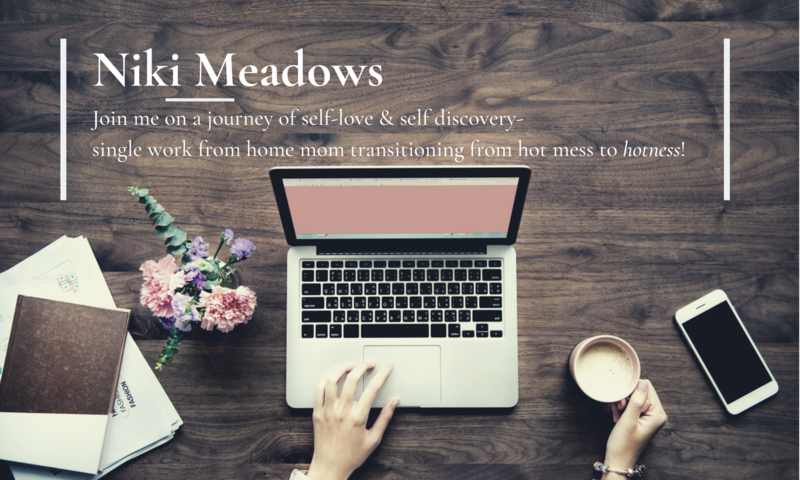 If you have any questions, need support, or would like to inquire about coaching services, don’t hesitate to contact me (niki@nikimeadows.com).